The diamond wire method allows the cutting of massive blocks as opposed to blasting techniques. 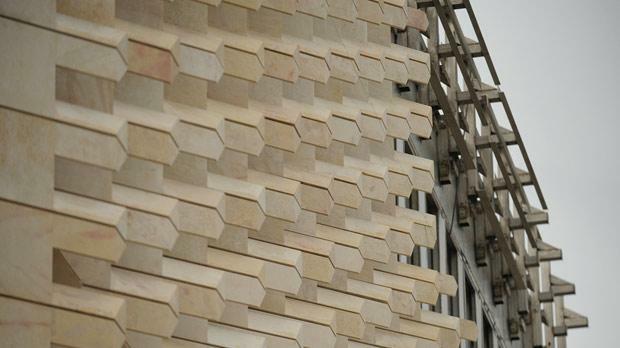 Malta’s honey-coloured hard stone, known as tal-qawwi, seems to have earned more appreciation since it started to be used to dress the south-facing façade of the new Parliament offices at City Gate. Until a few months back, the stone was used mostly to produce concrete aggregate but the Gozo quarry supplying the 7,000-piece jigsaw puzzle has noticed interest from the building industry and the incorporation of hard stone features in other projects. According to Grand Harbour Regeneration Corporation CEO Chris Paris, “the Maltese are starting to appreciate their own stone”. It is slowly being used in other architectural projects since world-renowned Renzo Piano insisted on dressing the controversial Parliament blocks in it. Its use has also introduced an innovative quarrying method that utilises what is known as a diamond wire, which allows the cutting of massive blocks, seven metres in length and three metres high, as opposed to blasting techniques. Mr Paris said being in the Qala quarry was “like being in Carrara”, the Italian city famed for quarrying marble. The dressing of the building was meant to have started at the end of February and be completed by June but the latest deadline is August. The project is on schedule, said Mr Paris. By the end of August, the whole building has to be completely sealed before the rainy season starts. Explaining the slow process, Mr Paris said the Floriana-facing façade was the most complicated because it had windows and the geometrically complex stonework was serving as louvers. An architectural team of 10 were working on that alone, he said, pointing out that it was not simply a question of cladding but of engineering, with the stones being attached mechanically. About 40 certified blocks of stone, cut into shape in Italy, are bolted in place every day. So far, about half the south façade, which alone requires 900 blocks, has been clad in the soft-coloured hard stone that is slowly warming up the steel skeleton. Its pink tinge changes depending on the light and it blends in with the surrounding bastions. “This design is unique in the world of architecture. It may not be Kansai Airport, but it is an equally important building for Renzo Piano because of its distinctive design characteristics,” Mr Paris said. 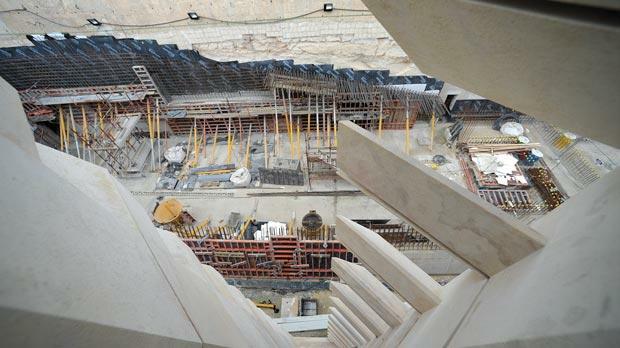 The hard stone is also being used in the internal areas of Parliament’s assembly hall, the “dramatic” skeleton of which has taken shape. The concept of merging the new building with the surrounding bastions is starting to fall into place, especially when witnessed from the upper floors. The shape of the back of the office block is such that it looks like Pope Pius V Street converges straight into it. One side is parallel to St James Cavalier and the other to the bastions. Even the structures housing the fire escape and lift are being covered in leaning walls – an aesthetic requirement to retain the resemblance to the inclined bastions. The stairs linking Republic Street to the underlying ditch, once unbearable due to the stench of urine, have been altered and redirected to end on the bridge. They will emerge from between two inclined blocks that are being built to look like they are moving apart to allow a slit of natural light onto them. Work under way includes the insertion of one of the steel blades in the fortifications, intended to mark the original breach it had withstood in the 1960s, in keeping with the philosophy of restoration that is based on clearly marking interventions. In August, the public should start entering Valletta on the original six-metre-wide Tumas Dingli bridge, by which time the accretions on one side would have been demolished and those on the other can start.